Peter Paul Rubens was a towering figure in the age of the Baroque, and his influence on later generations of artists was immense. His special position as both painter and diplomat brought him commissions from princely patrons, high-ranking statesmen, and noblemen. On a visit to Paris in 1625, Rubens met George Villiers, the first Duke of Buckingham and favorite of King Charles I. The occasion was Charles’s marriage-by-proxy to Henrietta Maria, sister of the king of France. 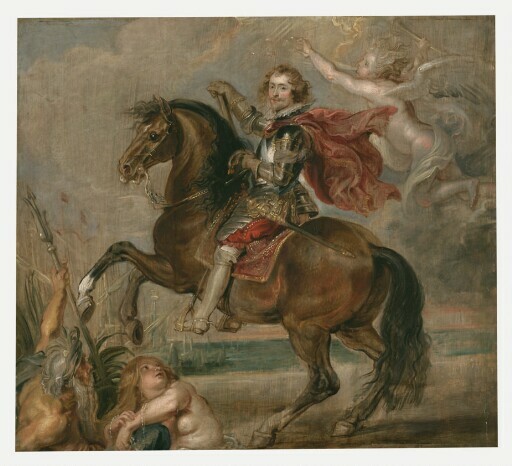 One of the chief collectors of his time, Buckingham commissioned a grand equestrian portrait of himself from Rubens. The Kimbell painting was the sketch for that work, which was destroyed by fire in 1949. The elegance and bravura that captivated Buckingham’s admirers—and inspired Alexander Dumas’ romantic depiction of him in The Three Musketeers—are evident in Rubens’s portrait. As Lord High Admiral of the Navy, the duke lifts his baton as his horse rears on command. Beneath him, the sea god Neptune and a naiad adorned with pearls indicate the duke’s dominion over the sea. Overhead, a winged allegory of Fame signals victory with a trumpet in hand. Privately Rubens noted Buckingham’s “arrogance and caprice” and predicted that he was “heading for the precipice.” History proved him correct. The duke’s unsuccessful military campaigns against Spain and France were much resented, and in 1628 he was assassinated. purchased through (Somerville and Simpson, Ltd., London) by Kimbell Art Foundation, Fort Worth, 1976.